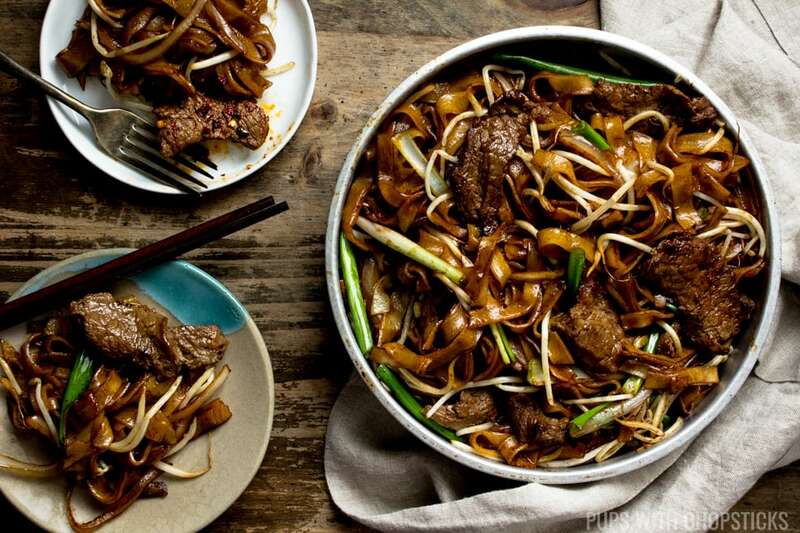 A classic Cantonese Beef Chow Fun Noodles (aka Gon Chow Ngo Ho) made with fresh flat ho fun rice noodles and tender flavourful beef slices that is simple and quick to throw together so you can enjoy this any day of the week! 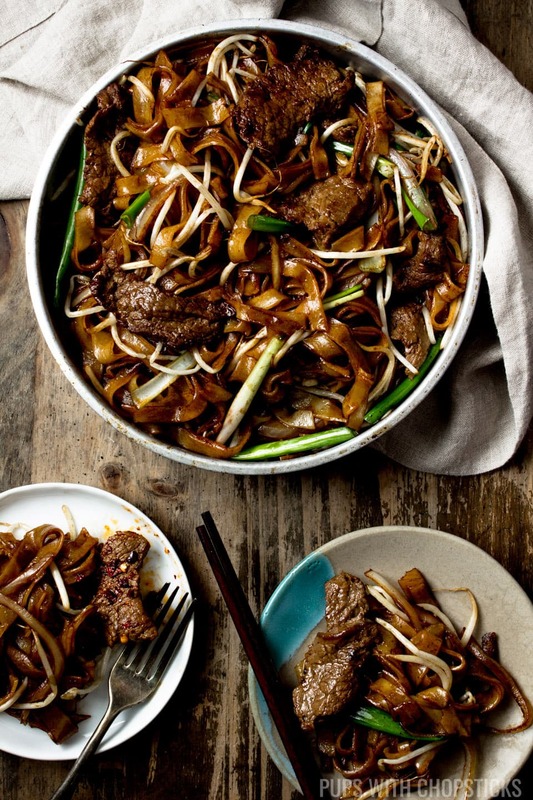 Beef chow fun is addictive with its chewy noodles and flavourful tender beef slices and it’s so easy to sit down and finish off the whole thing yourself without even knowing it. Even though it is easy to find these at takeout joints, you can easily make this at home for yourself as well, just make sure you have a good non-stick pan/well-seasoned wok on hand. The hardest part about this beef chow fun at home is making the noodles just right so they are not shredded into tiny pieces or mushy. Fresh ho fun is a tricky ingredient to work with at first, but once you get used to using it, it can be an amazing noodle to use to get dinner on the table in minutes. When I first started making beef chow fun at home, I used to buy whatever fresh ho fun I could find and thought they were all the same, boy was I wrong. The key to having long strands of chewy ho fun noodles that can withstand stir-frying is buying the right type of ho fun noodles. 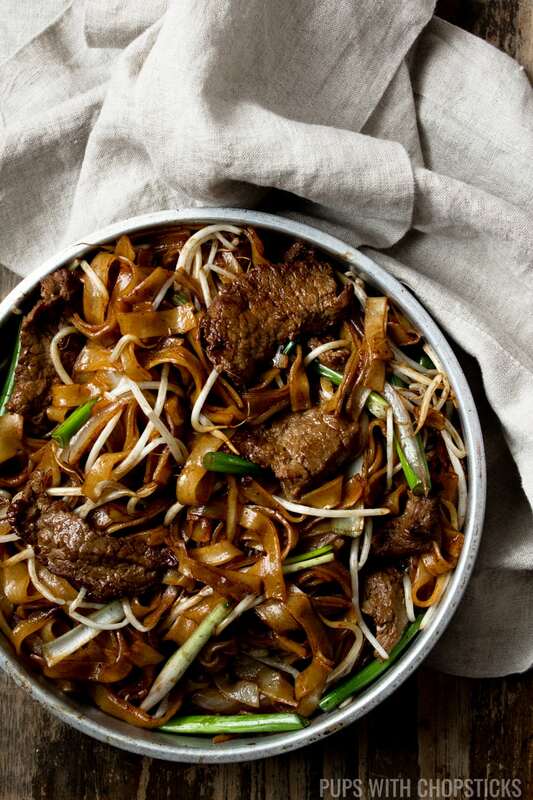 For this beef chow fun recipe, most of these ingredients can be found at your local Asian grocery store. 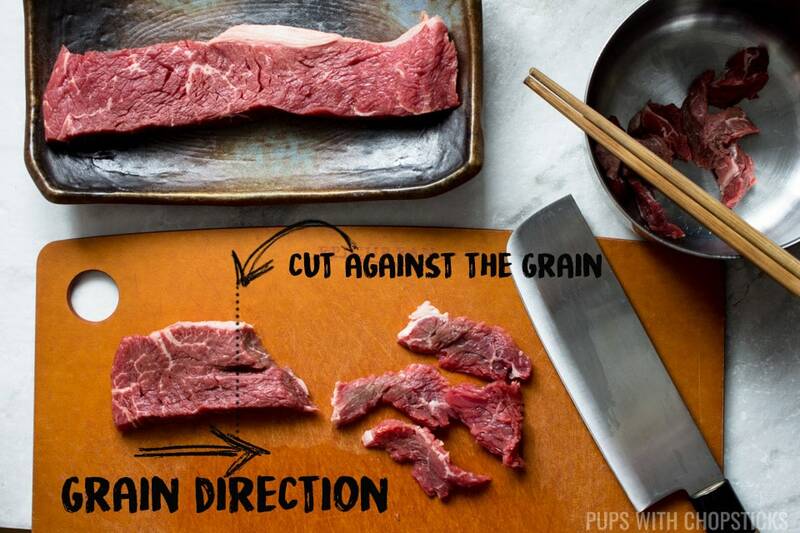 For the beef, you can use flank steak or any type of steak as long as you cut the beef into thin slices against the grain. If you can find it, try to use white onion. White onion is a lot sweeter and has a milder onion flavor so that when you flash fry it quickly and it’s still semi-raw it will have a nice sweet crunch without that strong raw onion bite. If you can’t find white onions, yellow onions work as well but cook them a bit more to remove the strong onion flavor. For any kind of stir-frying, try to stay away from the fresh ho funs that is smushed into a tiny bags (these are usually used for soup noodles), attempting to break up a solid brick of fresh ho fun noodles up will usually produce a very shredded and broken up noodle dish. You want to find ho fun that is either a sheet (that you can cut yourself) or pre-cut and laid out in strands. 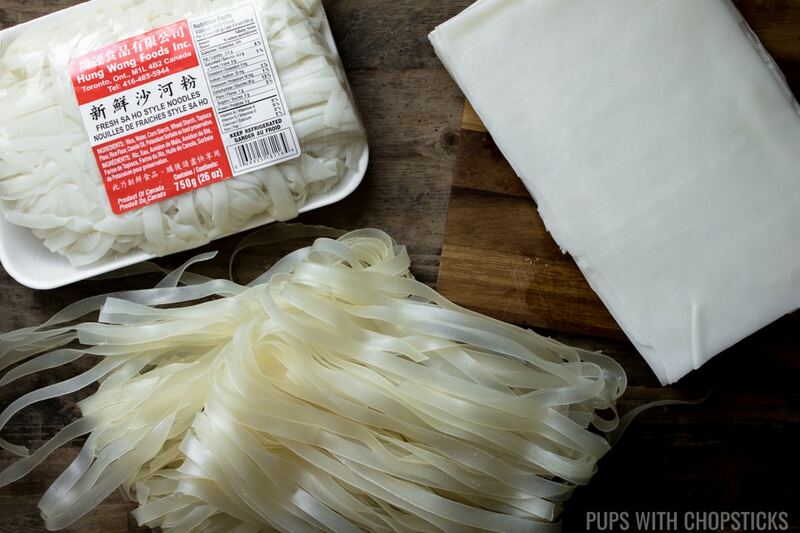 If you can’t find either of them you can use the dried flat rice noodles as well, just make sure it is wide and not the thin ones. 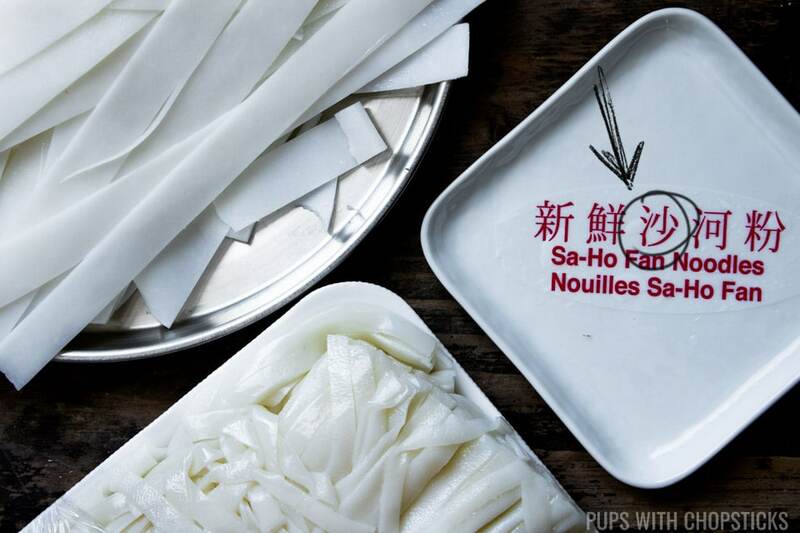 I personally find the pre-cut fresh ho fun works best – even though separating the noodles is a bit of a pain 🙂 I have not tried using dried rice noodles for this dish but it will be something I plan to test and will update this when I do! 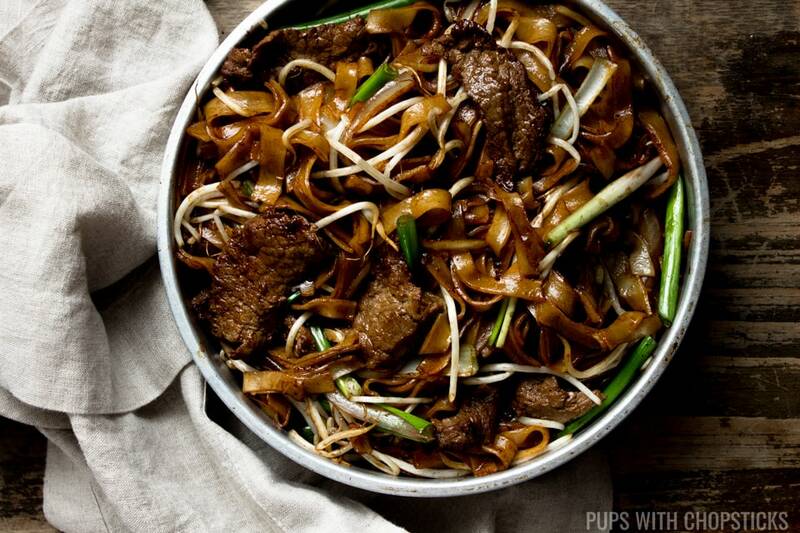 For this beef chow fun recipe, it is crucial to have everything prepared and on hand before heating up the wok/pan to start cooking this dish, this is because you need to work fast so that the noodles are cooked enough but not too cooked that it melts into the pan into a gloopy mess. This preparation step is pretty crucial to achieving evenly cooked noodles. When you are making this dish, you will be cooking it fast over high heat and noodles that are not separated will stick together and break up into small broken pieces so it’s definitely worth the effort to separate them before you start cooking. Fresh ho fun noodles softened via microwave and loosely broken up. An alternative to microwaving it would be to steam them. To break up fresh ho fun, I use the microwave and nuke it for 1-2 minutes, at 30-second intervals. At the 1 minute mark, check if the noodles are soft and easy to separate by hand. Usually, the noodles on the outer edge of the plate will get soft first, move the soft noodles into the middle of the plate and nuke it for another 30-60 seconds until everything is soft. Let the noodles cool before completely before stir frying it. An alternative to microwaving the noodles to separate them would be to steam them. Make sure the noodles have completely cooled before stir-frying. If you have ever made stir-fried fresh ho fun noodles, you will know that they can easily stick to frying pans and half your noodles will end up burnt and glued on to the bottom of the pan. The best way to avoid this is to make sure you use a non-stick frying pan or a very well seasoned wok. 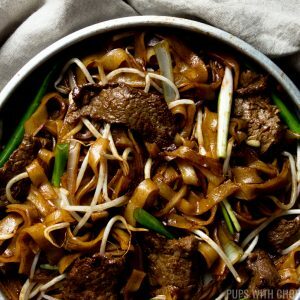 A classic Cantonese Beef Chow Fun Noodles (aka Gon Chow Ngo Ho) made with chewy flat ho fun rice noodles and tender flavourful beef slices that is simple and quick to throw together so you can enjoy this any day of the week! Slice the beef against the grain, and place it in a bowl with the marinating sauce. Mix well and set aside to marinate for 15 minutes. 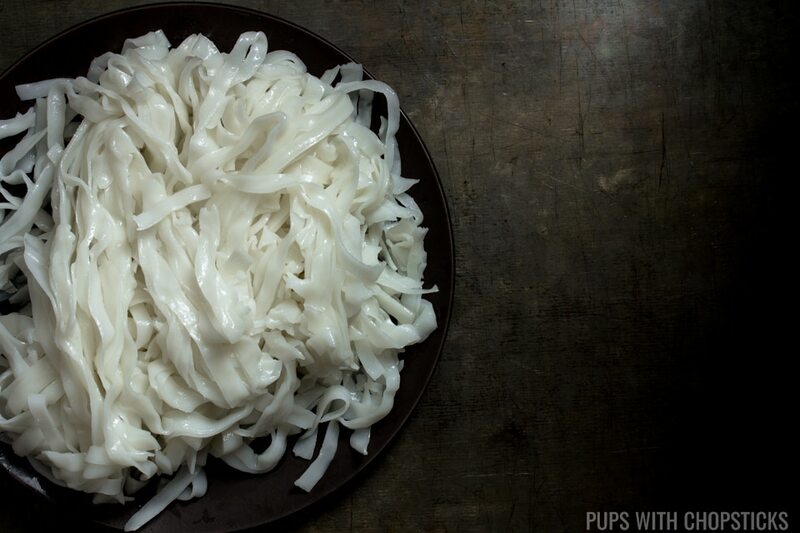 Place the fresh noodles on a plate and microwave it for 1-2 minutes in 30-40 second intervals. At the 1 minute mark, try to loosen up the noodles with your hands. The noodles on the outer edge of the plate usually will soften up first. Loosen the soft ones first, and then put them in the middle of the plate so the non-softened ones can be on the outer edge of the plate to have a chance to get soft. Once the noodles are a little soft and separated, set them aside to cool completely before stir-frying. In a small bowl, combine all the sauce ingredients and set aside. Set the stove to high heat and add a bit of oil to a non-stick frying pan or well-seasoned wok. Clean out the frying pan/wok and add in a bit of oil. Once the oil is hot add in the white onion and cook for about 1 minute. Then add in the noodles and the sauce mix at the same time and stir the noodles with the sauce. Use the sauce to soften up the noodles more, and keep moving the noodles around so it doesn’t sit too long against the pan (else it might stick to it). Cook it for about 1-2 minutes or until it looks soft. Throw in the bean sprouts and green onions and the cooked beef and quickly toss it into the noodles and turn off the heat. Try to use chopsticks instead of a spatula to toss and push the food around in the pan. Chopsticks are a bit more gentle and will help with keeping the noodles intact and not breaking it up into small pieces. If you are having a hard time cutting thin slices of beef, stick the beef in the freezer for 30-40 minutes and then try again. The firmness from it being frozen will make it easier to cut. An alternative to microwaving the noodles to soften it, is to steam it. I cannot in good taste write what I think of this sad excuse for sa ho fun. Its flavour base is nothing but an overdose of soy sauce mixed with sugar. Not even a hint of wok hei in the result. I’m sorry to hear you didn’t like this recipe. Wok hei is very difficult to achieve at home and it cannot be achieved purely with ingredients, it is more of a technique. That smoky wok hei flavor you get from eating Chinese takeout is achieved by cooking the food on really high heat in a searing hot wok and that flavor is actually the food being instantly seared from the intense heat (hence the smoky flavor). To achieve this at home, your stove must be able to go to very high temperatures to get that instant sear. You might be able to achieve this on a gas stove on high flame but it depends on your stove. Alternatively, you can also use a blow torch and do a quick sear to the food to also achieve that flavor but I did not suggest this method because a blow torch is not something a normal household would have and it’s a bit extreme to purchase unless you plan to use it often and if you know how to use it. Boy I wish I saw your recipe first! This is one of my favorite Chinese dishes so I decided to give it a go by using a different recipe and I suffered the pains of the tightly packed fresh noodles as you had warned about. This recipe also had me cooking the noodles before the meat and my wife (who I met in Xiamen and married her here in Boise) told me this was all wrong, also too much meat to noodles (almost 1:1). I just told her about your recipe and she said this must be from a Chinese person, this is the correct way. Anyway I will making your recipe for our next Chinese church potluck lunch in 2 weeks and will use dry noodles instead (we have 4 or 5 Asian markets here so a pretty good selection). I’ll let you know how it turns out! This is one of my favorite dish as well! 🙂 So I completely understand what you mean, I have had many failed attempts with the tightly fresh noodles as well 🙂 With the fresh noodles, the only ones that worked for me were the ones that are packaged in a styrofoam plate and plastic wrapped, you just have to warm them up in the microwave to soften them before separating them. The fresh noodles packaged into plastic bag and bundled up into a big chunk are very difficult to work with for stir fries so definitely avoid those. If you are using the dried noodles (which I find are the easiest ones to work with) make sure you soak them in warm water until they are soft before you stir fry it. I also find that the dry noodles need a bit more liquid when you are stir frying to reconstitute it, so you may need to add a few tablespoons of water to it while it is stir frying before adding the sauce. Hope this helps and hope it turns out for your church potluck! 🙂 Let me know if you have any questions as well! 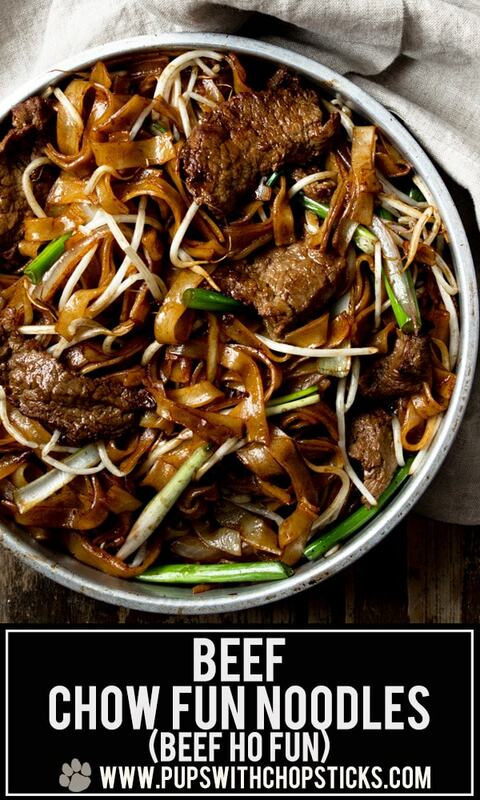 I love this Beef Chow Fun. Never get fed up. Easy to cook. 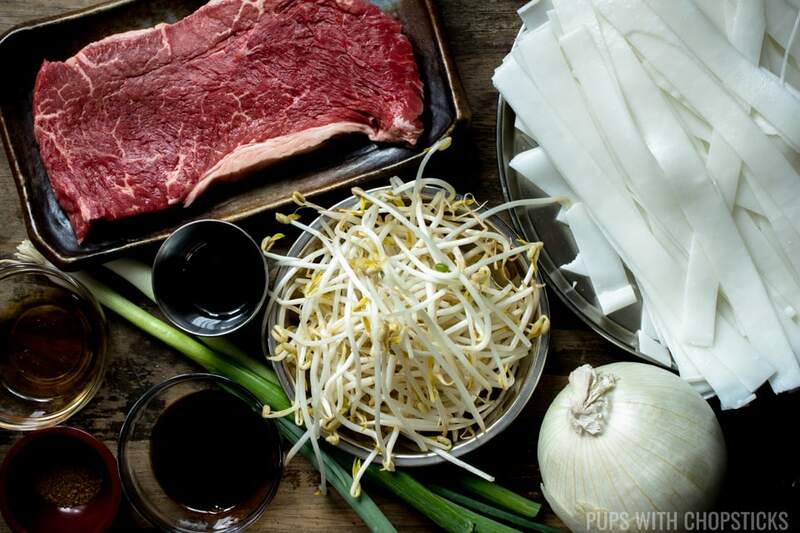 I personally add extra more bean sprouts to bring out better eating texture in the mouth. Thank you. Looking forward to make this at home, it seems delicious! 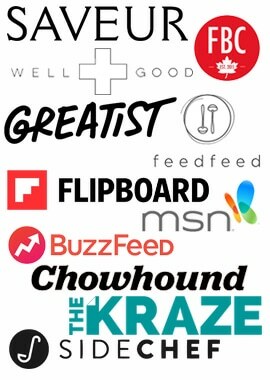 I just adore your blog posts Joyce, they are always brimming with such quality, useful information, and I always finish reading the post feeling armed and ready to cook like a pro! You have such an incredible gift for spreading your love and knowledge of food 🙂 Such a helpful explanation about the ho fun noodles too – I find I can get overwhelmed by all the different types of Chinese-style noodles when I’m shopping at the Asian grocery store, so this kind of information is incredibly helpful. I’m certain my boyfriend would also LOVE this dish, going to have to try it the next time I find some good flank steak at the store! This is amazing. My family will go nuts over all the steak and veggies. I just have to make it gluten free…which is no problem. Thanks for the inspiration! What a delicious hearty dinner this looks wonderful! This looks a tasty and hearty dinner! And what a delicious blend of flavors – pinning this to try, thanks! 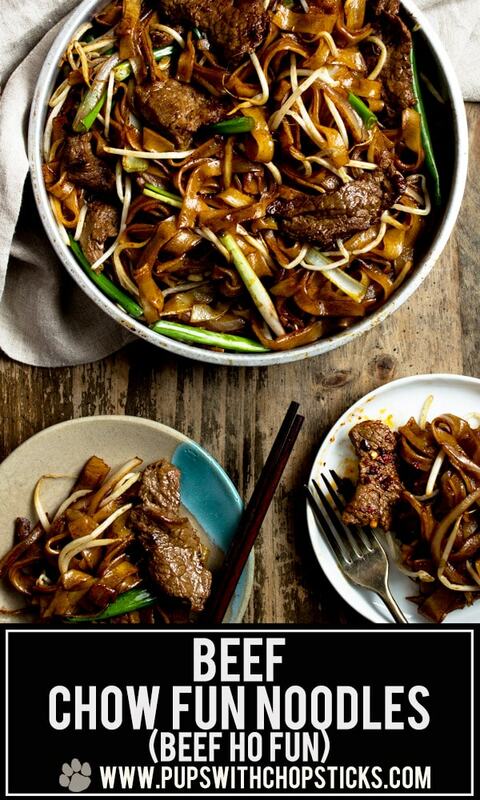 mmm … this Beef chow fun looks incredible! Very interesting combination of ingredients. I really like! I definitely want to try it and I’m sure it is very tasty! Thank you for sharing this great recipe! YUM! This is such a delicious dish, I love the flavors and the easy recipe. Can’t wait to make it!